Fiona is a committed Christian and has always felt that God’s path for her in life is to be a supportive friend to those in need. She feels as though she has a calling to listen to people. Fiona currently visits several people both in their own homes and care homes to help alleviate the symptoms of loneliness. This has led her on a spiritual path, helping and comforting people which has deepened her own relationship with God. In addition, Fiona advises the GTR train company about accessibility needs on the network. 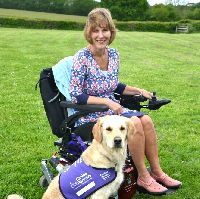 Fiona has a registered Canine Partner called Mr Wiz who helps her with everyday tasks that she finds difficult. He is developing his listening skills!